Here is a small collection of nice videos showing hang gliding in Lanzarote. You can get a good idea of what the island has to offer the visiting pilot and how beautiful the landscape is. There is no where else that offers such a diverse mix of sea front ridges, volcanoes, open landing areas and clement winter climate. Seeing is believing so come and try flying in Lanzarote for yourself. Here is a video of a nice flight taking off at El Cuchillo going to San Bartolome then the lower Teguise take off and back to the microlight field. 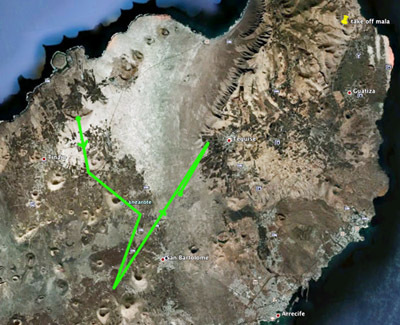 Here is the flying route that was taken.